In 1975, Robert E. Ray established our law firm. Our attorneys possess a track record of success at the negotiation table and in the courtroom. They put their skills and experience to work for Greeley residents and those throughout Northern Colorado. Read more about our firm overview. When you arrive for your initial consultation, we will not tell you what you want to hear. We will not make promises that we cannot keep. In fact, if your legal problem can be handled without an attorney, we will advise you on next steps and send you on your way. We only take cases if we truly believe that we can do a better job than our clients could on their own. For more information or to schedule an initial consultation with an experienced Greeley criminal trial attorney, please fill out the intake form on our contact page or call 970-351-6083. For the convenience of our clients, we are available on evenings and weekends by appointment. We also have a Spanish interpreter on staff. Hello, my name is Robert Ray and I am a trial attorney who has been practicing law in Colorado since 1970. To this day I am at times amazed that I am living where I live and doing what I do for a living. During high school I played football, ran track, ran cross country and boxed. I graduated third in my class, (two girls who didn’t play sports beat me out), I was elected senior class president and voted by my classmates “most likely to succeed”. When I was concluding high school one of my counselors told me that I should go on to college. I told him that I was not going to go on to college at that time, but would after I finished a stint in the Air Force. My counselor stated that if in fact I went into the Air Force I would never go on to college. I served in the Air Force for approximately four years starting in 1959. During those four years I served as an Air Intelligence Specialist for two years, attended the Prep School at the Air Force Academy for one year and then taught boxing and wrestling at the Prep School for one year. During my time in the Air Force I took up the sports of judo and wrestling. Except for the fact that in wrestling I finished second in the nation for small colleges in 1966, I believe my athletic career to this date is pretty well stated by the phrase “jack of all trades and master of none”.Upon conclusion of my Air Force career (I did not go on to the Air Force Academy because I had had enough of the military by that time), I received a wrestling scholarship to Eastern Michigan University. When I started my scholastic endeavors at Eastern Michigan University I had planned on being a mechanical engineer. Unfortunately, during my first year of wrestling I separated my shoulder and could not do mechanical drawing. I therefore somewhat whimsically changed my major to a double major of Math and Economics. It is my opinion to this date that the Math major was the best major I could have had to prepare me for the practice of law. Math teaches one how to go from point A to point B without any deviation. However, at that time I didn’t know what I really wanted to do for a living, I had contemplated becoming a wrestling coach upon graduation. In my senior year of high school I was asked to participate in the senior class play. It was a murder mystery. I had asked to be the judge. However, the teacher presiding over the play stated that I would have to be the defense attorney. I enjoyed playing the part of a defense attorney immensely. During my last year of education at Eastern Michigan University I reflected back on the part I had played in that play. I then decided to go to Law School. My applications were put in somewhat tardily to the University of Michigan, Wayne State University and Colorado University. Wayne State University accepted me. However, that was the year of the race riots in Detroit and I decided I did not want to participate in an educational program in Detroit. The University of Michigan accepted me but said that since my application was in so late that I would have to wait a year to start my attendance. I had not sent in my $50 application fee to CU when I sent in my application. I sent in $50 and within a week received a letter of acceptance from Dean Reed of the University of Colorado School of Law. During Law School I normally worked full time selling vacuum sweepers, working for a retail credit company and working for the City Attorney’s Office. I must say that I found Law School to be much easier than my Math major at Eastern Michigan University. To this day I believe that one of the reasons Law School was so easy for me was because I had been given a speed reading course while attending the Air Force Academy Prep School. That speed reading course made it possible for me to read approximately 2000 words per minute with 90 percent comprehension. Since Law School is basically reading, the speed reading course greatly enhanced my ability to progress through Law School. I graduated from Law School and passed the bar without any problem. I originally took a job with a law firm in Denver. I drove to Denver from my residence near IBM for two days. During that time I ascertained that if I were going to continue with that employment I would have to attempt to find parking every day, and pay for the same, fight traffic every day and stand in line to obtain lunch every day. I decided that was not the life for me and therefore decided that I would try to find a small town in Colorado in which to practice law. I looked on the map, found some small towns and started making inquiries about the availability to find someone with whom I could share offices. I found an advertisement for Waldo & Waldo in Greeley, Colorado, contacted Ralph Waldo and ended up sharing offices with Ralph Waldo, his dad and Clay Apple. In approximately December of 1970 Bill Crosier, with whom I had attended Law School, approached me and indicated that he was going to go work for Bob Miller, the new District Attorney, and thought that I should apply also. I met with Bob Miller, liked him immediately and he hired me. The previous District Attorney had been a part time District Attorney. When we took office in January of 1971 we walked into an office without any furniture and with seven piles of cases. The first day we were in office I had a county court jury trial. That was the first jury trial I had ever seen. The second day we were in office I had a two day felony trial as co-counsel with Bob Miller. It was on a theft case regarding cattle in which the bank had a security interest. It was a pretty bad case from our perspective, so bad Bob Miller decided that I could handle it on my own after the first day. I served as the Assistant District Attorney for Bob Miller until July of 1975, in retrospect I believe that this is the best job I ever had. I would have stayed with the District Attorney’s office much longer. However, the commissioners at that time set our salaries. They determined that they would not pay anyone the maximum. I believe the maximum at that time was $21,000 for an assistant district attorney. They wanted to me pay me $20,700. I determined at that time that if that was their attitude, I no longer desired to work for the county. I was offered a job by Walker Miller who later became a Federal District Court Judge. My time with Walker Miller was very educational and certainly helped me succeed in the practice of law. Throughout my career as a lawyer, I have been blessed with first of all working with Bob Miller who I believe was the best District Attorney Weld County has had. Secondly, I have been blessed to this date with excellent associates, paralegals and secretaries. Three of my associates have been former public defenders. Contrary to the popular belief, the public defenders are in my opinion very excellent lawyers with very few exceptions. The three associates I have had who were former public defenders have turned out to be exceptional attorneys and great friends. At this time my wife, Esy Ray manages my office and handles the interpreting for me, Vince Vigil is an associate who is as good as one can be and Valerie Moreno and Shelli Kelly are both progressing into being excellent paralegals. I find myself to be very fortunate to have an immediate family consisting of my wife (who manages my office and my home); and my daughter, Rebecca and her husband, Tyler together with my grandson Owen and one on the way; my daughter Jessica and her daughter Haylie; and my son Randy, his wife Marcela, his son Rylan and his daughter Keila. What one should glean from the foregoing is that my life has not been programmed by me. It seems that things just happened and I kind of went with the flow. I consider myself to thus far have had a very blessed life. Indeed, many of my friends in the sports I now enjoy of golf, bowling and fishing have nicknamed me “Lucky”. I have indeed been very lucky by having the parents that I had and living on a farm in rural Michigan; and, having the coaches and teachers I had in high school, college and law school; and, having the opportunity to work with Bob Miller; and, having the opportunity to work with Walker Miller; and, having a wife who can run both my office and my home; and, having been able to hire very competent and loyal staff; and finally having the God given talent to practice law rather than hauling hay or digging sandstone. I am looking forward to at least another twenty years of practicing law (maybe someday I will get good at it and won’t have to practice), playing golf, bowling and fishing. In the famous words of Paul Harvey “now you know the rest of the story”. Hello, my name is Vincente Vigil and I am in my third year as an attorney with the Law Office of Robert E. Ray. Before joining this office I worked in the Weld County Public Defender’s Office, where an extremely heavy case load helped sharpen my litigation skills and prepared me well to be a successful associate in a private practice. I am a Weld County native, growing up in LaSalle. I have 3 brothers and a sister. Most of my younger years were spent with my family on the carnival circuit. I graduated with an English Degree from CSU, but after graduating I strongly desired to go on to something bigger. I decided I either wanted to be a Librarian or a Lawyer, so I applied for both. The School of Law at CU responded to my application first, so that’s where I enrolled! I worked my way through law school by becoming an award-winning pastry chef at Coyotes! My career goal and focus is first to take care of my family well and then to genuinely help and advocate for people, especially during a time that advocating for themselves can feel unfamiliar and overwhelming. What I love most about this specific Law Office is the staff that I get to work alongside of on a daily basis. They are friendly, professional and truly care about our clients and each other. Of course, my next favorite thing is how Esy Ray keeps the refrigerator well stocked and each day treats us to homemade burritos! I appreciate getting to practice alongside Bob Ray and have learned so much from him. He has taught me about effective trial presence, how to carry yourself in front of a jury and many other valuable aspects of being a great and well-respected trial attorney.My wife Kathy and I have a beautiful 4 year old little girl who lights up any room she walks in to, and we have two baby girl twins on the way! In what little leisure time I have, I enjoy fishing, running, hiking, camping, kayaking, and spending time with my family. I hope to spend many more years at this Law Office and continue to help build upon the already solid reputation and relationships that have been established here. Hi my name is Valerie Moreno and I joined the staff here at the Law Office of Robert E. Ray as a Paralegal in February of this year. After graduating from Northridge High school I was selected to be a faculty and staff assistant at IBMC and assisted the faculty and staff in both the medical and legal areas of study. I have always found the field of law to be very interesting. It was when I was going through a divorce that I decided that I wanted to better understand and be able to be an active and knowledgeable participant in that legal process, so I enrolled in the legal study program at IBMC. I graduated IBMC with an Associate’s Degree in Paralegal Studies and a Paralegal Certificate. Before joining the team here I worked as a Paralegal at a law firm specializing in Personal Injury Law. I am very excited to be working in criminal defense. I find it very challenging and interesting. I am especially excited about being able to use, increase and expand my bilingual skills, as I have been given the opportunity to learn from the very best as Esy Ray has vast experience in legal interpreting and has played an integral part in launching the successful careers of numerous Spanish Court Interpreters for the state of Colorado. I love working with my other teammates here as well. I appreciate being able to shadow, observe and learn from both attorneys both in the office and also in a court setting. I enjoy working with the Senior Paralegal, Shelli, as she is helpful, knowledgeable and is a team player. It is great how we all do our part on all our cases and work together as a well-functioning team to accomplish the best possible outcome for our clients.I am a single mom with a seven year old boy who is generous, outgoing, full of energy, and I find it’s often like a second job just keeping up with him! We do a lot of things together but some of our favorites are going to Estes Park, the zoo, and having countless water gun fights during the summer. I LOVE the Denver Broncos and spending time with family and friends watching the games together. I hope to continue to learn, grow, and expand my skills and I think this Law Office provides the best opportunity for me to do that. I look forward to growing along with this office and the incredible team of dedicated and caring staff that I count it a privilege to be a part of. Hi! My name is Shelli and I am the Senior Paralegal here at the Law Office of Robert E. Ray. I have had many jobs in my life, a few of which are being a studio vocalist, dental assisting, teaching K-8th grade music and being an Assistant Principal; however I think I have finally decided what to do when I grow up! I am going into my fourth year at this law office. I have always had a passion for law and its many facets and served many years in the victim advocacy arena before becoming a paralegal. I received my Paralegal Certificate from University of Colorado Denver, and also hold an Advanced Paralegal Certificate from Purdue University with six areas of advanced certification including Criminal Law, Criminal Procedure, Alternate Dispute Resolution, Victim Advocacy, Education Law and Family Law. I love my job, our team, and feel that we work together very well to get the best outcome possible for our clients. My personal focus and goal within our team is to effectively assist our clients and their families navigate what can often be a confusing, unfamiliar and sometimes even scary legal system. Most of all, as it depends on me, my focus and number one goal is ensuring our clients get a fair trial. I have been married for 33+ years to my husband Ron. We have 4 grown children and I'm “Glamma” to 7 of the most beautiful grandchildren you’ve ever seen. I enjoy sunshine and being on the water, boating in the summer and snow skiing in the winter. I enjoy singing with two different bands and entertaining our audiences.I absolutely believe we have two of the best attorneys in the business and count it an honor to be a part of this awesome law office. I look forward to many more years serving on their team! 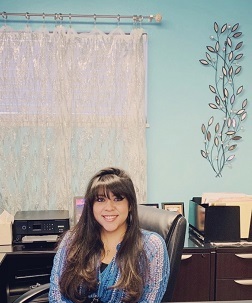 Hi, my name is Esy Ray and I am the Office Manager and Spanish Interpreter for the Law Offices of Robert E. Ray. I am a certified Court Interpreter and own Esy Ray & Associates, Interpretation and Translation. I am also Bob’s wife and I feel very fortunate that our chosen professions allow us to work so closely together. Bob is a trial attorney specializing in criminal defense and I have worked in the Colorado Court system since 1983 with an emphasis in criminal law. Bob and I love what we do and are very lucky to have assembled a team of lawyers, paralegals and interpreters that are the very best in the business. I was raised in Texas and as a child traveled throughout the United States working in the fields as a migrant worker. I loved the work and enjoyed all of the new and exciting cities we lived in. I will be forever grateful that my parents decided to make Colorado our permanent home in 1974 and settled in Milliken in 1976 where we still gather to enjoy my mother’s homemade tortillas and tamales. As a child growing up I was taught to be proud of my Mexican heritage and my mother made sure that I could fluently read, write and speak the Spanish language. I grew up interpreting for family and friends but never realized that it was actually a career choice. I have had many interesting jobs such as waitressing at Johnson’s Corner, plucking feathers from turkeys at Longmont Foods and working at the Air Traffic Control Center in Longmont. In December of 1983, with much trepidation I accepted a temporary part time position as a court interpreter in the Weld County Courts in Greeley. One of the first cases I was assigned to interpret for involved Robert Ray and Al Dominguez as opposing attorneys in a civil case. Al Dominguez is from Puerto Rico and did not recognize a word I used and objected to it. Robert Ray got up and told the judge that if the interpreter was incompetent we should get a new one. I was not very happy and took his comment as a personal challenge to become the best interpreter I could possibly be!Fast forward 33 years and Bob and I have been married for 23 amazing years. We have two beautiful daughters, Jessica and Rebecca. We have been blessed with two amazing grandchildren, Haylie who is 16 and Owen who is 3. Rebecca is expecting our second grandson in November and we could not be happier to welcome him into our family. On my free time I enjoy cooking, baking and working in our yard. I also love to travel to our home away from home in Puerto Vallarta and consider all of my friends there as a second family. Another passion of mine is doing volunteer work and fund raising for many of the great charitable organizations that Greeley has to offer especially if it involves women and children. This is such a loving close knit community that genuinely cares about one another and it has been a joy to see Greeley grow and prosper.